On January 30, 1889, tucked away in the royal Mayerling hunting lodge just south of Vienna, one of history’s most tragic love stories unfolded. 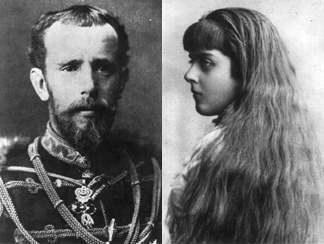 On that morning, the servants of Rudolf, the Crown Prince of Austria, awoke to a horror: the bodies of their 30-year-old master and his 17-year-old mistress Baroness Mary Vetsera slumped and lifeless in their shared bed. This heartbreaking vignette threw the royal house into instant chaos, and left a pervading mystery with which we continue to struggle—but it would also shake the Imperial order to its very core, priming Europe for the upheaval, destruction, and violent modernity of World War I. As such, the Mayerling Incident has gone down in history as an enigmatic tale of star-crossed love, youthful folly, and unthinkably dire consequences. That January morning, Rudolf’s valet had gone to call the Prince for his scheduled hunting excursion, only to find there was no answer at the door. He then enjoined Rudolf’s hunting partner, Count Joseph Hoyos, to call for the Prince—but again, silence. The two men, growing more disturbed, began to force the door. It wouldn’t budge. Whipped into a frenzy, the valet finally resorted to smashing down the entrance with an ax. The room inside was quiet, shuttered, and dim, but the valet and the Count could just make out a horrific sight. The Prince was sitting on the bed, hunched slightly forward and with blood seeping from his mouth. The young Baroness was lying next to him, utterly unresponsive. Both bodies were already cold, rigid, and beyond all help. Taking in a scene he could barely comprehend, the valet noticed that there was a glass beside Rudolf on the bedside table; the man assumed his master had ingested a poison like strychnine, which causes bleeding. He was mistaken, but this small eyewitness error would take on a life of its own, as whispers began swirling that Vetsera had poisoned her lover before taking her own life. It was the first of many false rumors to circulate about the ill-fated Rudolf and his lover, only adding to the mystery—and its tragic answer. But what really happened that day? In the months following the incident, fact and fiction became difficult to separate. 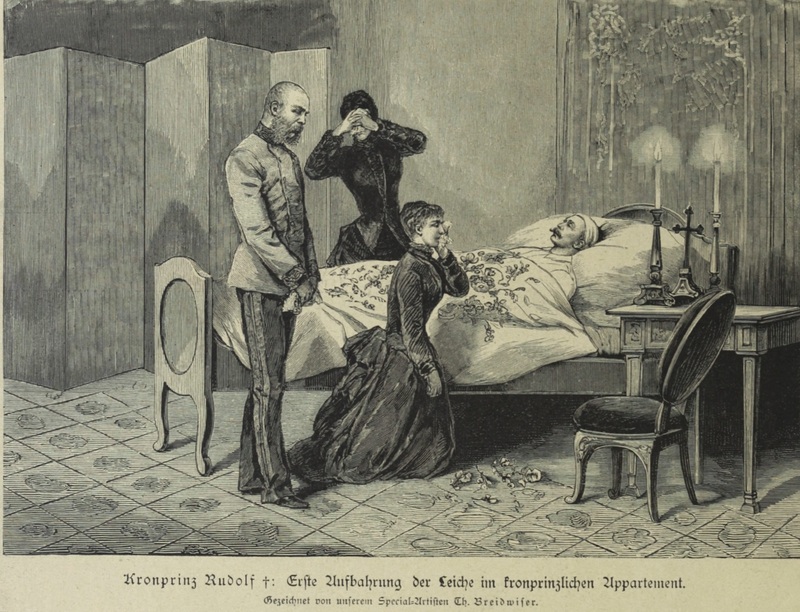 The first official report stated that Rudolf died of a heart attack; no mention was made of the Baroness, whose body had been hastily smuggled out of Mayerling under cover of night and unceremoniously buried in a village cemetery. 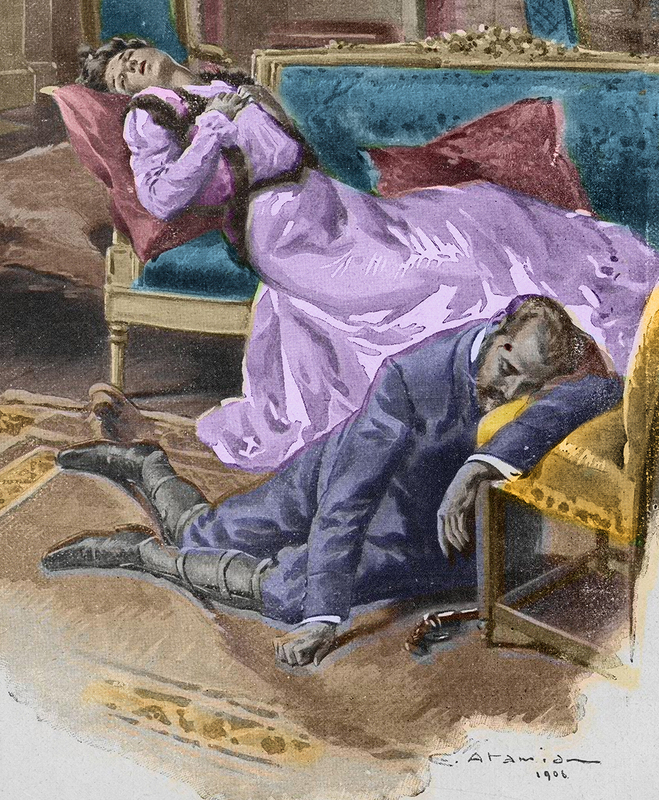 But when news leaked that Vetsera had indeed been present at the scene of the crime, Austria revised their story and released a more chilling account: the lovers had engaged in a suicide pact, with Rudolf first shooting Vetsera and then himself—though only after sitting by her lifeless body for several hours. This second report seemed to ring true. By the time of the incident, it was common knowledge that the Crown Prince was unhappy with his marriage to Princess Stephanie of Belgium, and was drowning his troubles in the ample bosoms of the young Mary. Sources also reported that Emperor Franz Joseph had recently commanded his wayward son to end this embarrassing affair with a teenage girl, perhaps pushing Rudolf into a rash decision. Even so, relatives of the royal family struggled to come to terms with the event; Empress Victoria of Germany wrote that “Poor Rudolf’s death [was] a terrible misfortune,” and she refused to countenance the idea of a pre-meditated suicide pact. Even with the royal skepticism, the second official report of events remained unchallenged for nearly a century. Then in 1959, modern research turned the accepted story on its head. When Dr. Gerd Holler unearthed Vetsera’s body and inspected her remains, he alarmingly could find no traces of a bullet hole, and began to question how Rudolf could have killed her before shooting himself. Holler appealed to the Vatican’s archives of the incident, and the Papal Nuncio confirmed that the 1889 reports stated that only one bullet had been fired that day. Faced with this forensic evidence, Holler suggested a new turn of events: Vetsera had suffered an accidental death, possibly from the effects of a botched abortion, and Rudolf, mad with grief, had shot himself in response. Holler’s theory was a stark re-reading of the incident, adding one final tragedy to a dark day, but there another twist on the horizon. On July 31, 2015, the 126-year-old case was blown wide open when the Austrian National Library released the contents Vetsera’s private letters. Previously, experts had assumed these letters were destroyed or lost to the sands of time, but they turned up decades later in a safety deposit box. 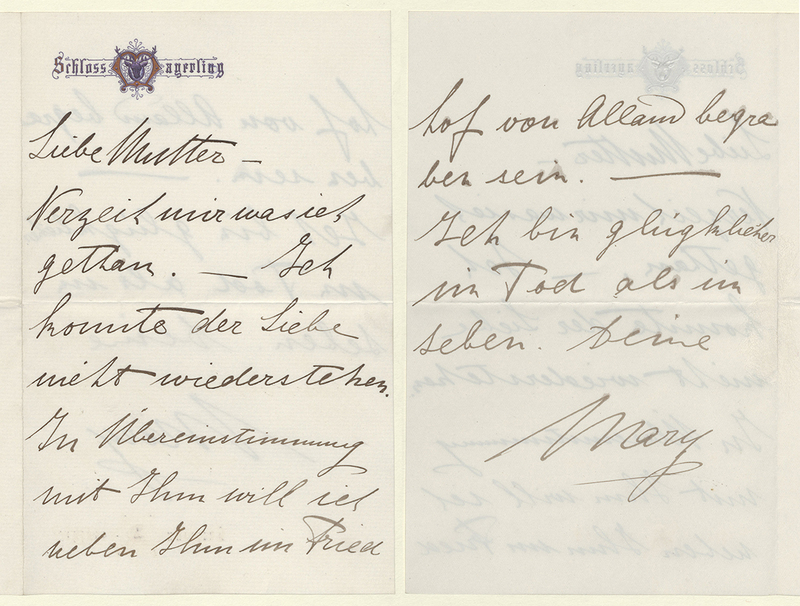 In them, Vetsera writes from Mayerling just before the tragedy to wish her mother and family a heartbreaking farewell; she fully confesses her suicide pact with Rudolf and avows their undying devotion, laying to rest a century of rumors and disbelief. This resolution, however, cannot dampen the letters’ disturbing impact. Looking back on these missives, we look back in time to the vibrant, loving, and indeed tormented life of a young girl—knowing that she will soon end that life, and knowing there is nothing we can do to stop her. And questions still remain: wasthere only one bullet fired? If so, how did Vetsera actually die? Her remains were too damaged to conclusively tell. But even with all the turmoil left to us, perhaps the two lovers still got what they wanted: their love eternalized and memorialized in that bloody day. Mayerling, however, is not just a tragic love story frozen in time; it was also a brutal catalyst. Rudolf’s decision not only left his parents bereft—his mother Elizabeth openly mourned her son for the rest of her life—it also left Austria without a direct male heir. The burden eventually fell on none other than Archduke Franz Ferdinand, the man whose assassination in 1914 triggered World War I and led to the eventual collapse of the entire Austro-Hungarian Empire. 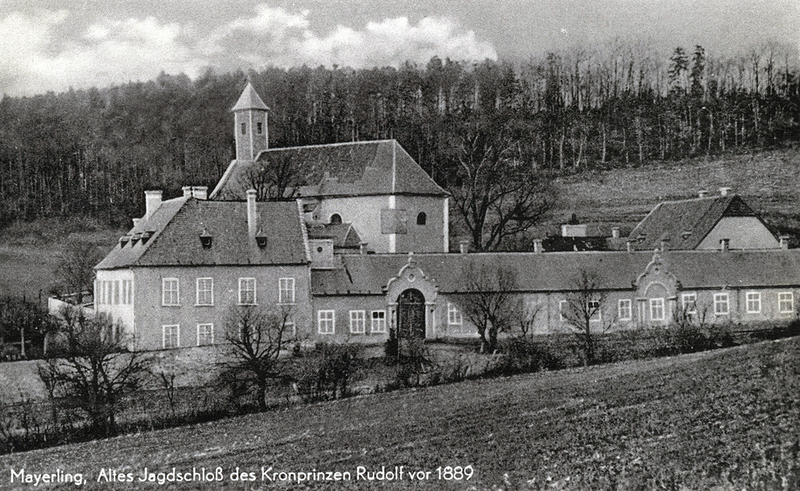 By that time, Rudolf’s mother was already dead; an Italian anarchist murdered her in 1898. Taken as a whole, then, the Mayerling Incident can never be just a desperate act preserved in amber, a romantic tale of a lovesick Romeo and his Juliet. It was also the swan song of an old world, one where isolated, inward-turning rulers were often felled by their personal foibles, teenaged loves, and unhappy marriages. But after Mayerling? No monarchs. No kingdoms. No Europe—at least as the world had known them. Mayerling is a minutely personal story of love and angst, but it also dragged the world stage, kicking and screaming, into the harsh light of the twentieth century. A dubious honor, but a compelling story.